The team behind ARLnow has a mission: to make local news more interesting, engaging and actionable for a new generation of digital-first news consumers in Arlington and in other dynamic, live-work communities. In support of that mission, we’ve been getting ready to launch a new site for Tysons, McLean and Vienna later this month. But we’ve had a major setback and need to ask for your help to overcome it. Last month we went to download a list of nearly 3,000 subscribers who had signed up via a Facebook ad that had been running since late spring. Our launch strategy was predicated on growing an initial subscriber base, primarily via a large investment in Facebook ads, and we had promised our advertisers that the site would launch with at least 3,000 subscribers. To our dismay, only around 1,600 email addresses were included in the file we downloaded. Upon further research, we discovered that Facebook has a policy — not revealed when placing the ad — to only store subscriber email addresses for 90 days. There were no notifications prior to almost half of our subscribers being purged and Facebook has refused to refund our money, restore the deleted email addresses or do anything, other than recommend that we submit a comment in a suggestion box for the ads product team. Even attempts to escalate the matter via Facebook’s local news outreach team were unsuccessful. A new ad campaign we tried to launch turned out to be prohibitively more expensive than the original. 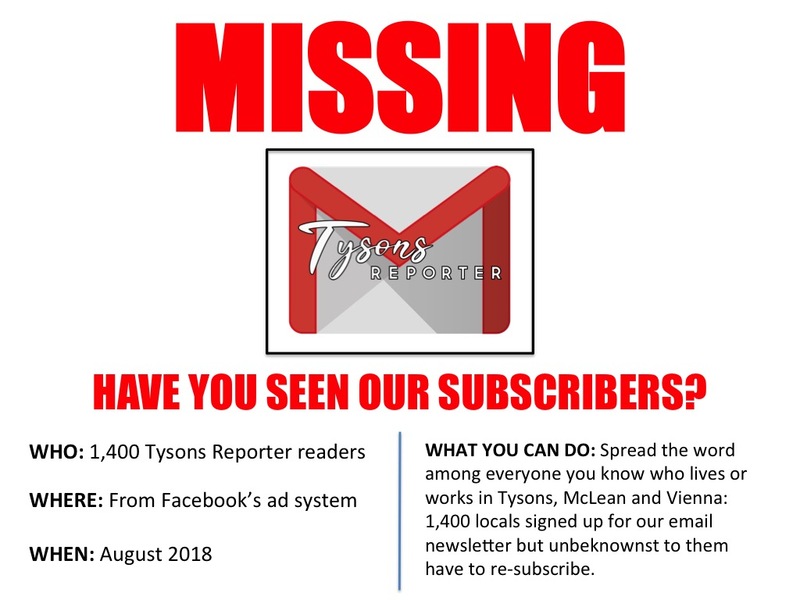 So here we are, two weeks away from the launch of Tysons Reporter and there are 1,400 people who think they’ve subscribed to a new local news site but have no idea that they’ll never hear from us. With the viability of Tysons Reporter and the future of our company on the line, we are now turning to our only hope to fix this mess: you. Please, share this post on social media (yes, even on Facebook). Email people you know in Tysons, McLean and Vienna who might have subscribed. Tell Facebook to do a better job of serving its small business clients and supporting local news. If you’ve signed up for Tysons Reporter via Facebook, please use the form below (or via this link) to re-subscribe. If you haven’t subscribed but want to, you can also use the form below.